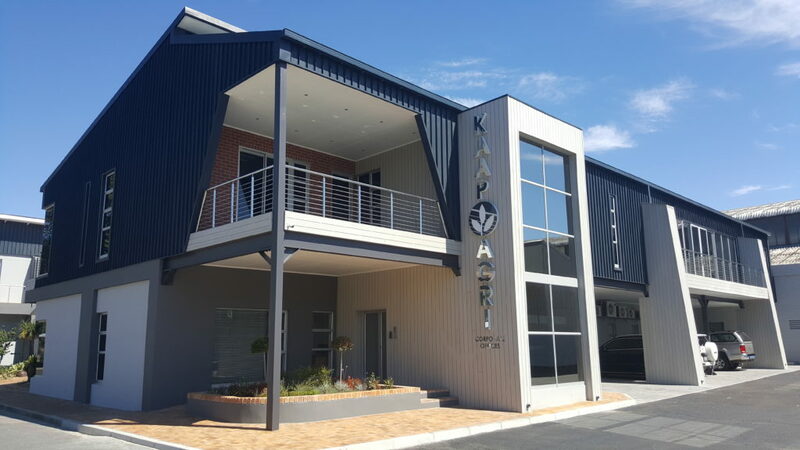 The striking and functional Kaap Agri building in Paarl, Western Cape, symbolises the professionalism and success of an organisation that has been operating for more than 100 years. 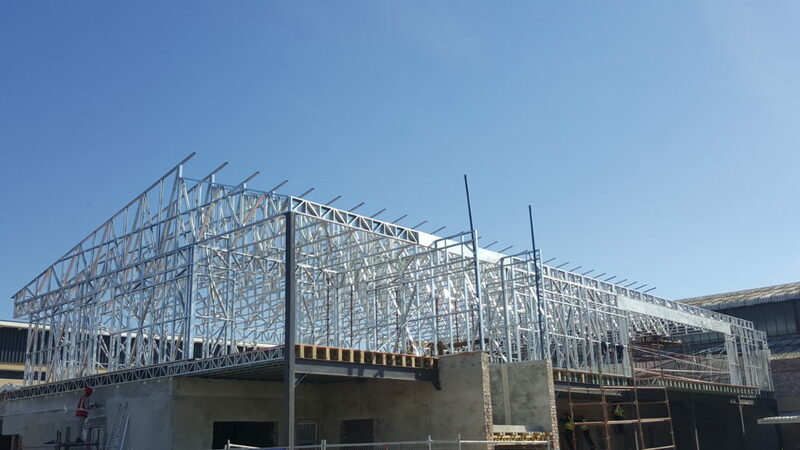 Recently Charl van Zyl, CEO of Rancor, leading light steel frame (LSF) construction company, was asked for a solution to add a second floor to the Kaap Agri’s existing building, adding 570 m² to the floor area by vertical extension. The stipulations for the new structure were clear: it had to be cost-effective; it had to comply with building regulations; be acoustically well insulated; be energy efficient and had to be built in double-quick time. “Taking all these into account, a light steel frame solution was certainly the most appropriate,” van Zyl says. The initial design – before Rancor was called in – was based on brick and mortar with concrete beams to support the second floor, but after the foundation footings were uncovered, it was apparent that additional footings would add so much cost and time to the project that the design was not a viable option. Rancor was then invited by architect/engineering firm De Kock & Vennote to provide a solution in LSF that would comply with the requirements. This was done successfully. “LSF met all the requirements and, in addition, resulted in lower loading of the existing walls,” van Zyl says adding that Stahlbau Construction, the main contractor, accepted the solution without hesitation. Apart from adding a second floor to the building, the interior of the existing ground floor had to be totally refurbished. LSF floor joists, 350 mm deep, were installed at 300 mm spacing to support the new lightweight floor. The joists span 6.5m and are supported by the existing brickwork. The flooring consists of 21mm thick shutterply boards laid over the floor joists, followed by 12mm thick fibre cement boards supplied by Marley Building Systems. Special sound mats were placed between the joists to reduce sound transmission. The sound insulation was further enhanced by installation of suspended acoustic ceilings with an ample ceiling cavity. Excellent acoustic insulation was a non-negotiable requirement. The walls for the second floor consist of LSF wall panels, clad on the outside with a Magnesium Oxide board, followed by Tyvek vapor permeable membrane. Top hat sections, 20mm deep, were then horizontally fixed to the structure, serving as brandering to fix the external Diamond Deck pre-painted profiled sheeting, thus providing a durable and robust external skin. Glass wool Cavity Bat insulation, supplied by Isover, was installed in the wall cavities created by the LSF, provides the required thermal insulation (R > 2.2 m².K/W). The internal lining consists of 15mm thick fire rated Marley Gypsum boards. Light steel trusses were used for the roof structure, spanning 17 meters, with wide openings onto the front deck over the exterior stagger glass doors. Top hat cold-formed steel sections, 40mm deep, were used as purlins to which the pre-painted Diamond Deck profiled steel sheet was fixed. ‘The LSF shell of the project (floor, walls, and roof) was completed in three months with internal finishing taking a further three months. The client moved into his new head office on the planned date with great enthusiasm – another satisfied customer!’, added Van Zyl. • LSF buildings appear no different to ‘conventionally’ built structures, except that the quality of finishes is typically better with the former. It has found rapidly growing acceptance for ‘affordable’ as well as up-market buildings in South Africa. • It is a cost-effective building method, with financial savings emanating mainly from significant time savings to complete building projects, less rework, reduced logistical costs –which are of growing importance due to the escalation of fuel prices and general construction inflation – and a drastic reduction of wastage and rubble on building sites, when compared with the brick-and-mortar alternative. • LSF building is significantly more energy efficient than heavy construction methods – both with regard to ‘embodied energy’ of the materials and components, as well as ‘operational energy’ relating to heating and cooling of the building over its design life. All three of Barnard’s criteria are met on the Kaap Agri project. In fact, as far as energy efficiency is concerned, the R-value (the measure of thermal insulation) of the Kaap Agri external walls is greater than 3 m².K/W which is more than four times better than what would have been achieved using a double brick wall. So successful was the solution brought by Rancor to Kaap Agri, Rancor was asked to assist with a solution to the Kaap Agri Simonduim project, about halfway through the Paarl Head Office construction period. Both projects were finished on time and within budget. Kaap Agri began formally with the establishment of De Westelike Graanboeren Koörporatiewe Vereniging (Wesgraan) in 1912 as a cooperative. Over the years the company expanded in the neighboring towns and areas. In 1981 a large amalgamation took place when Western Province Fruitgrowers and Wesgraan joined forces to form WP (Koörperatief) Beperk. In 1995 WP (Koörporatief) was converted to a public company, WPK Landbou Beperk. The current Kaap Agri had its origins when WPK and Boland Agri amalgamated in 2005. Today the Kaap Agri area of operation includes the Swartland, Boland, Wynland, Overberg, Langkloof, Namaqualand, Orange River, Sundays River Valley, Namibia, and the areas in between, as well as Limpopo, Mpumalanga, and Gauteng. Please help. I reside in Khayelitsha Township. I am interested in building a light steel structure. I own a 450 square meters, maximum height above base level of 25m (7 floors) land in a Litha Park Business designated area. I am very much interested in building a light steel frame 7 Storey Building that could be used for residential and commercial purposes. Any advise on light steel structure building planners and general advise for this project will be appreciated.